English is acknowledged as necessary language to enable the Indonesian community to involve in global communication; it is taught even from kindergarten. The students must be able to understand all skills in English. There are four skills in learning English, namely listening, speaking, reading and writing. According to Brown (2004: 218), writing is a skill that is the exclusive domain of scribes and scholars in educational or religious institutions. As the basic of learning those skills, the role structure and vocabulary are very crucial. Writing is important as teaching speaking, reading, and listening because the learners can express their ideas, feeling, and experiences in certain place, time, and situation in written form. Therefore, writing skill need to be taught to the student. According to the Zemach and Rumisek (2005 : 54), the teaching of writing is important because of the reasons : the first reason is writing reinforces the grammatical structure, idiom and vocabulary that teacher has been working within the class. 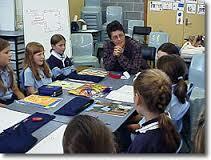 The second reason is when the student writes, she or he has a chance to be adventurous with the language. Finally, the student becomes involved with the language, with himself or herself and with his or her readers. However, most language learners realize the learning to write fluently and expressively are difficult. It is because writing needs simultaneous control of number variables. This argument is supported by Zemach and Islam (2004 : 12 ), that there are some aspects included in writing such as control of content, rules of syntax, format sentence, grammar, punctuation, vocabulary, and ????? Belum ada tanggapan untuk "IMPROVING WRITING SKILL THROUGH GUIDED WRITING"